IBA monitoring is well established in Africa and provides conservationists with vital information on the changing status of the region’s biodiversity © Caroline Thomas/RSPB. Important Bird and Biodiversity Area (IBA) monitoring by BirdLife’s African Partners has revealed that many are in a poor state, with some seriously affected by damaging developments. 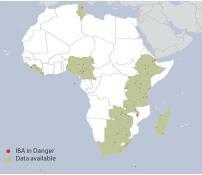 As part of a global BirdLife initiative called ‘IBAs in Danger’, an analysis of pressures on IBAs conducted in early 2013 by the BirdLife Africa Partnership identified an initial list of 75 IBAs in Africa at extreme risk of losing their biodiversity value. The list will be used to target enhanced conservation effort for these sites, through advocacy, campaigning and local action. The conservation of Important Bird and Biodiversity Areas (IBAs) contributes significantly to the preservation of birds, other biodiversity and the many ecosystem services on which people depend. However, many IBAs are in a poor state and subject to high pressures. IBAs in Danger are sites that have been identified nationally through monitoring as being at severe risk. The IBAs in Danger initiative aims to advance concerted actions to mitigate threats at these sites and prevent them losing their biodiversity value. IBA monitoring is done using the BirdLife IBA monitoring framework, a simple, practical and robust tool that integrates data from a wide range of sources: field observers, research reports or even remote sensing. 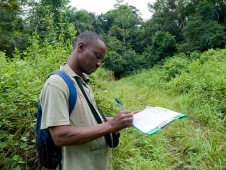 The information collated is used to assign scores on a four-point scale for pressure (the threats faced by the site), state (condition of birds and/or their habitats) and response (the action being taken to conserve the site). Findings from the analysis of IBA monitoring data are used to target enhanced conservation effort for these sites through advocacy, campaigns and local actions.